Combine all ingredients in a blender and process till smooth. Walnuts are great for heart health. This smoothie is loaded with protein. The cinnamon is anti-inflammatory and the celery adds salt back into the body. The bananas have potassium and prevents cramping of the muscles. 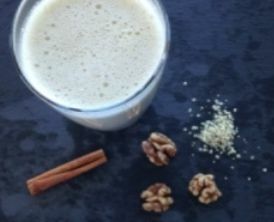 This smoothie helps in muscle recovery and building!